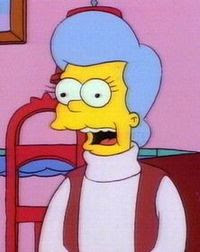 In short, the character of Homer’s mother on The Simpsons is, to say it quickly, a little complicated, and not just because we didn’t know what her name was for years and years. Unless I’m mistaken, last Sunday’s episode of The Simpsons, which featured Homer’s fugitive mother, was the first to every actually state her name, Mona Simpson. In her first major episode, “Mother Simpson,” Mona re-appears after having been on the run since Homer’s childhood. Homer and family know nothing of her criminal past as a 60s renegade, but they eventually suspect out that all is not well with her and go through her purse, revealing IDs for Penelope Olsen, Mona Simpson, Mona Stevens, Muddy Mae Suggins and Martha Stewart. Aside from the throwaway Martha Stewart gag, the list of pseudonyms merits a mentions for longtime Simpsons fans because it includes a reference to a name incorrectly assigned to Homer’s mother years before her appearance in the series. The Simpsons Uncensored Family Album book, one of the better early Simpsons tie-ins, included extensive family trees for both the Simpson and Bouvier families and listed Homer’s mother’s name as Penelope Olsen. I like that Simpsons writers performed that small bit of fan service for us diehards by slipping the name, even in a small way, into an actual episode. Regardless, that bit of trivia isn’t the most interesting thing about Mona Simpson. I looked her up on Wikipedia and found that her creator, writer Richard Appel based her in part on his author wife Mona, whose maiden name is Mona Simpson and who continues to write under that name. (I’ve actually seen her name in bookstores before, noted the similarity to Homer’s mom’s name and didn't give it another thought.) This Mona just happens to be the full sister of Apple CEO Steve Jobs, though the two didn’t meet until adulthood because Jobs was adopted by another family. Weird for two reasons: First, there’s the oddness in Mona Simpson the real-life author marrying a man by the last name of “Appel” when her adopted brother rose to fame by co-founding the Apple corporation. Second, the real-life Mona Simpson not meeting her adopted brother until adulthood mirrors a plotline in the Simpsons episode “O Brother, Where Art Thou?” in which Homer meets his long-lost, adopted-away brother, Herbert Powell, who is also the CEO of a successful corporation. (Until Homer ruins him, of course, but in a later episode he becomes successful again. Such is life.) You’d think that, perhaps, Richard Appel had written that episode too and was perhaps drawing on his wife’s life experiences with the Homer-Herb story, but that’s apparently not the case either: Jeff Martin is listed as the episode’s writer. A final note about Mona Simpson: Glenn Close, who provided the character’s voice in all three of her appearances on the show, apparently couldn’t properly belt out a “D’oh!” and, thus, in the final cut of “Mother Simpson,” the annoyed grunt is provided by Pamela Hayden, who voices Milhouse.